According to the Mosaic Law – a law already given to Abraham by the Lord Himself – everyone who wanted to be a member of the people of Israel, of God’s chosen people, had to undergo a particular bloody operation. This law extended to all men. 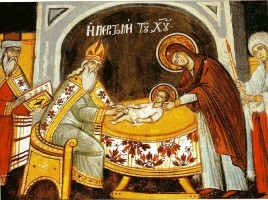 Circumcision, as it was called, was performed. The sign of circumcision remained for life. It was a reminder that this person was a member of the people of Israel. But nearly everything that took place in the Old Testament was merely a shadow indicating something that was about to become manifest. The Old Testament always speaks of the coming New Testament. Much of what took place in the Old Testament pointed – sometimes clearly, sometimes obliquely – to events that were to be fulfilled in the coming of our Savior, Jesus Christ, and after Him. 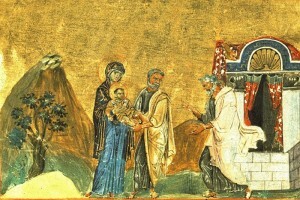 Thus, bodily circumcision served as a sign of the new circumcision in the New Testament, a circumcision that was no longer bodily, but spiritual. What is this spiritual circumcision? The Lord Jesus Christ repeatedly said: If any man will come after Me – that is, after the Lord Jesus Christ into the Heavenly Kingdom, into God’s glory – let him deny himself, and take up his cross, and follow Me. This self-denial is what spiritual circumcision is. But what does it mean to deny oneself? It means denying the sin that has penetrated everyone’s soul and body; it means that denying sin is equivalent to denying oneself. Man is filled with all manner of passions, which have eaten into him like cancer, a disease that eats into man’s body and grows at his expense; only a difficult, painful operation can save him. Thus with sin it is necessary, as it were, to operate, to circumcise – that is, to circumcise sin, to cut it off – so that man would remain healthy. 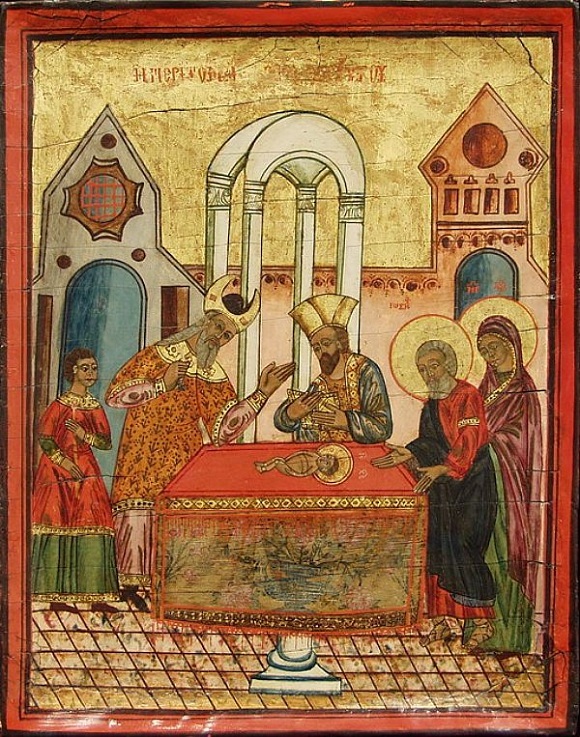 For just as without circumcision, which in the Old Testament took place on the eighth day after a child’s birth, someone could not enter the society of the chosen people, so too without spiritual circumcision a Christian cannot enter the Kingdom of God. We need to perform this spiritual operation upon ourselves constantly: every day, one might even say every minute. I will offer some examples that demonstrate how we can perform this spiritual circumcision upon ourselves. Here someone sits down to eat, gets carried away by his appetite and, although he has long been full, keeps stuffing his stomach and, if possible, keeps drinking, until in the end he turns from a person into some kind of animal. Things get even worse when we are dealing with carnal, licentious feelings and desires. The same is true with other sins. One needs to recognize these sicknesses and, as it were, to circumcise them from oneself by abstaining from gluttony, drunkenness, and all carnal deeds: one needs to cut them off. For the most part, however, man cannot do this to himself alone, for he has been made a slave of sin and of the devil, who is always inciting him to commit all manner of sin by affecting his nerves, his body, and – if the Lord allows it – by affecting his mind as well, corrupting it in such a way that he might, for instance, overeat to the extent that he will later suffer very grievously. Another example: the thought occurs to someone of going somewhere to celebrate. It is clear that if he goes somewhere, whether to a neighbor’s or somewhere else, he will certainly talk nonsense, judge, and gossip, besides getting drunk and the like. If he had been in church that day and received a certain amount of grace and spiritual succor, then by going out he will lose everything and take on a demonic state there. Man therefore needs to circumcise all these sinful thoughts, desires, and intentions at the very beginning. “Six days shalt thou labor, and do all thy work,” the Lord says, “but the seventh day is the feast of the Lord thy God.” Therefore, try not to go anywhere on this day; stay at home, read the word of God, and stand to pray, if this is possible and if circumstances allow, or else pray silently, maintaining the spiritual disposition that you acquired in church; do not run away somewhere, speak idly, judge anyone, and so forth. So we have left church, seemingly having prayed, and we are walking down the street. What do we do? We look around: there’s so-and-so; that person’s going somewhere-or-another; we look to see what kind of nose that person has, what kind of face; the person over there is beautiful; we look through this window. Thus, before one gets home one will have committed a thousand sins. These are the sorts of dissipating thoughts that make us look at, listen to, and see things that we should not. This is what we need to cut off, to circumcise. Envy, lies, deceit, vanity – and on and on! How many sins cling and stick to man, seemingly becoming part of him. It is only with great pain and effort and by calling upon the name of God – “Lord Jesus Christ, Son of God, have mercy and help me!” – and only with prayer, exertion, and effort that we can cut them off. This is why it frequently says in the Gospel that the Kingdom of God can only be taken by force, by effort, by exertion. Man must always remain in a state of attention, crying out: “Lord, have mercy!” What does it mean to say: “Lord, have mercy”? It means to be vigilant, that is, too be attentive to oneself, to struggle against every sin – not only in deed, but in word, in thought, and in feeling, cutting them off and circumcising them. We cannot do it alone: most of this we cannot do, because we are so mired in sin. Therefore call upon the name of God: “Lord Jesus Christ, Son on God, help me!” Thus man must be attentive to himself for his entire life, from childhood to death, every day and every minute; he must not give in to the will of the eyes, or the ears, or especially the tongue, or to any desires; he must not allow himself any fantasies, but must reject everything foolish, cutting it off and destroying it with the help of calling upon the name of God, upon the name of the Lord Jesus Christ. It must be said, very regretfully, that people who appear reasonable, people who in the eyes of many seem to be standing in the forefront, do not understand what I am talking about to you. They think that if someone goes to church sometimes, and if she even reads akathists and the Psalter at home, and takes care of her domestic chores, that she has already done everything and that nobody can be better. And if she even does some little prostrations sometimes or reads through Midnight Office, then no one can possibly be above her. She judges everyone and does not see that she herself is full of sin, that in her entire life she has never struggled, that she has never been attentive to herself, that she has never cleansed herself, that she has never worked on any of this. Therefore she remains full of sins: gluttony, drunkenness, fornication, every kind of impurity, envy, pride, condemnation, idle talk, hatred, enmity, and the remembrance of evil. Thus it often happens that someone who is completely filled with all manner of sin and abomination, someone who is repugnant before the Lord, considers himself righteous because he goes to church and occasionally reads the Psalter and akathists. But is this the case? 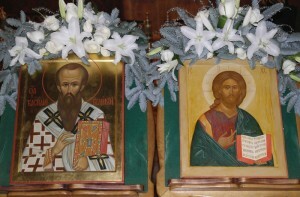 Akathists, divine services, prayer, and fasting have all been given to man to help him cast out all manner of filth from himself, to help him circumcise himself, to help him take up his cross of battling with sin. The Lord assists us by sending help in the form of involuntary afflictions. For instance, if someone cannot overcome gluttony, drunkenness, or fornication – then the Lord sends illness. If someone is proud or vain ­– then the Lord abases him before everyone so that he becomes the very least person in people’s eyes. If a Christian is bound to the earth and all his powers, desires, and dreams go into acquiring earthly prosperity, justly or unjustly, by stealing or cheating – then the Lord will take away everything he has. Thus, the Lord also adds involuntary afflictions to our labors in battling with our sins, as an aid in this battle. Every Christian’s cross is formed from this battle with sin and from these involuntary afflictions. If a Christian truly understands his own calling and the meaning of afflictions, then he will resignedly bear his cross. But if he does not understand this, then he will begin to complain and to judge the Lord Himself: “Why does the Lord send me afflictions, sickness, and the like? Am I really worse than others?” And that keeps us outside the Kingdom of God. Thus, in the Gospel you see that the Lord is constantly saying that we should be vigilant, that we should be attentive to ourselves, that we should bear our cross of battling with sin and enduring afflictions, and that we should deny ourselves. If the Lord Himself was crucified for our sake, if He became the Lamb of God Who took upon Himself the sins of the world, if He suffered for us – then we Christians should take up our little crosses and suffer in the battle with sin in order to cleanse ourselves, in order to make ourselves worthy of entering not some place resembling anything earthly, but of entering the Kingdom of God itself, of being in communion with the Lord, of making ourselves children of God. But one must work for this, and love the Lord, and thank Him, and implore Him, that He might help us to become cleansed of our sins, and that He might grant us the strength to bear our cross until the end of our lives. Just as the Lord descended from the Cross to the grave and then arose, so too do we need to descend from our cross to the grave in order to pass over to the Lord in eternal resurrection. 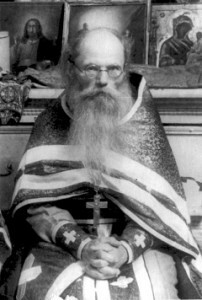 Thus, over the course of our earthly life we need to deny ourselves, to circumcise all sin from ourselves, and to bear the cross that the Lord has given us without murmuring, with gratitude, beseeching Him to help us to spend our lives in Christian manner, to die in Christian manner, and to inherit the Kingdom of God prepared for all the true followers of Christ from the creation of the world, where all will shine like the sun in the ineffable joy of the Divine Light. Amen.